Bob the Builder - Can Do Zoo Game - Download and Play Free Version! Build Bobland Bay Zoo From the Ground Up in This Awesome Adventure Based on the Hit Television Series! The sleepy town of Bobland has received a surprise shipment of animals destined for the Bobland Bay Zoo. Unfortunately, the Bobland Bay Zoo doesn't actually exist! Luckily, Bob the Builder and his Can Do Crew are ready to spring into action! 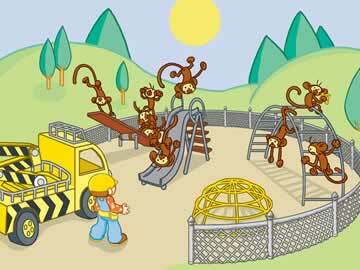 Help Bob the Builder build a zoo before the animals turn the town upside down. Can you fix it? Yes, you can! Problem Solving: Can we fix it? Yes, we can! Bob the Builder has a reputation for teaching children about the power of a can do attitude, and this game follows in that tradition. Preschoolers are introduced to random problems that require unique solutions, and this shows children that problems are merely puzzles waiting to be solved. This mindset leads to success in all areas of life. Colors, Shapes and Patterns: The real world is full of shapes, patterns and colors. In this game, players frequently encounter pattern and color puzzles that require memory and recognition. Essential shapes, colors and patterns are gently drilled through minigame activities throughout the game, leading to familiarity. Linear Directions: Following directions is one of the most essential life skills, but it can be difficult to teach a preschool child about the importance of following directions in a step by step manner. Bob the Builder - Can Do Zoo teaches children the value of linear directions naturally by introducing them to the building process. Kids complete blueprints and are rewarded for building structures in a logical manner. In this game, success equals stickers! There are tons of fun and interesting stickers to collect and earn. Feel free to build your own scenes with the stickers you've collected. Bob the Builder is popular all over the world thanks to the show's beloved characters. Kids will enjoy playing and building with their favorite members of Bob's Can Do Crew. The game also features Bob the Builder's catchy theme song, making each gameplay session feel like an episode of the show. This game was designed to fit the needs of preschool children. The bright and colorful menus are simple to navigate for non-readers. Mousing over any button on the screen prompts Bob the Builder to read the option out loud, making it easy for preschoolers of all skill levels to play this game all by themselves. Bob the Builder - Can Do Zoo has easy, medium and hard difficulty settings, making it a game that adapts to players. In addition, the game also features story mode and free play mode, giving you more ways to play. 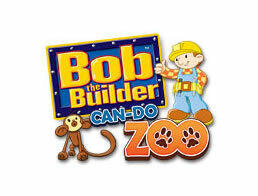 Overall, Bob the Builder - Can Do Zoo is a fantastic game for preschoolers of all ages and skill levels. For fans of the series and newcomers alike, this title is a must play!